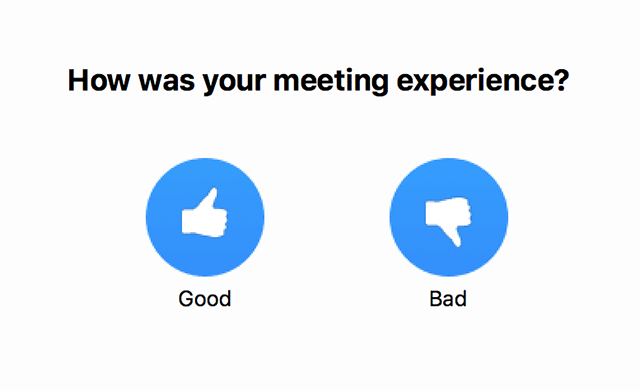 When a meeting ends, the attendee will be prompted to click either Thumbs up or Thumbs down. This information is collected and provided to the account administrator for analysis and improvements. To enable the End of Meeting Feedback survey, you must turn on Feedback to Zoom, which adds a Feedback tab to your desktop client and mobile app in the settings. 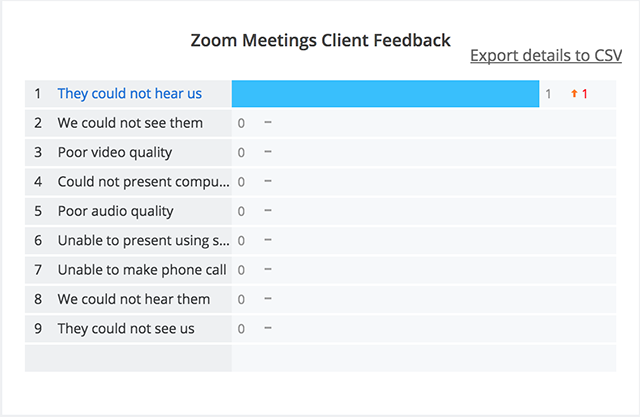 This allows you to send Zoom feedback at any time about your meeting experience or about the Zoom desktop client or mobile app. You can also use the End of Meeting Feedback Survey with Zoom Rooms. Read more. Navigate to the Display end-of-meeting experience feedback survey option on the Meeting tab and verify that the setting is enabled. After ending the meeting, the survey window will appear. If you click Thumbs Up (Good), you will not be prompted for any additional information. If you click Thumbs Down (Bad), you will be asked an additional question about what was wrong with the meeting. Login to your Zoom account as an owner or admin. Adjust the date range for the reporting that you would like to obtain. Scroll down to Zoom Meetings Client Feedback. 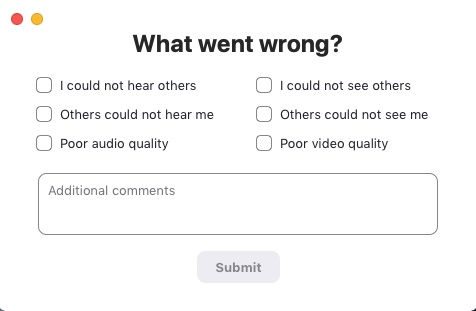 This will display all bad feedback and the problem(s) that the user chose. You can also export this to a CSV file, by clicking the option at the upper right of the window.